Although Thailand had small naval components throughout much of its long history, the development of a modern navy capable of carrying out combat missions dated from the post-World War II period. Thereafter, the size and efficiency of the Royal Thai Navy increased steadily. Of the three service branches, the navy was the least involved in national politics and therefore was able to concentrate more of its time and efforts on its security mission. The mission spaces of Thailand navy include the Thai Gulf and Indian Ocean, separated by land, and river. Naval affairs were directed by the country's most senior admiral from his Bangkok headquarters. The naval commander in chief was supported by staff groups that planned and administered such activities as logistics, education and training, and various special services. The headquarters general staff functioned like those of corresponding staffs in the army and air force command structures. 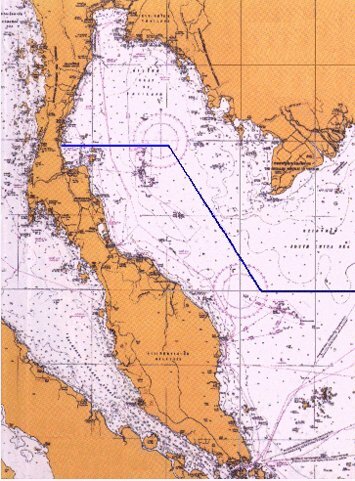 For operational purposes, the Royal Thai Navy has adopted the area command concept by organising operating forces into three naval area commands to cover the assigned areas of operation. The First Naval Area Command is responsible for the upper part of the Gulf of Thailand The Second Naval Area Command is responsible for the lower part of the Gulf of Thailand. The Third Naval Area Command is responsible for the Andaman Sea. Thailand's naval fleet, though small, operates primarily out of the sprawling, modern naval station at Sattahip, southeast of Bangkok. The Royal Navy has a marine corps, modeled on the American pattern, skilled in both amphibious and jungle operations. The RTN has personnel strength of 64,000. This complement includes the manpower of the Naval Air Arm (1,200), Marine Corps (20,000) and Coastal Defense Command. There are 27,000 conscripts in the navy; enlistment is for two years of national service. Reportedly, it is the least politicized of the three services, although the navy is developing a blue-water capability which may increase political prominence. Thailand's Andaman Sea region is the likely focus of such an initiative. Procurements have been consistent with this plan. A major concern for the navy is distributing its new equipment in the most efficient way. The navy took steps to upgrade its maintenance and support capability, partly as a result of the acquisition of the large aircraft carrier and replenishment ship. The Chuk Samut facility within Sattahip Navy Base includes a first-class dry dock built by Hyundai. The RTN has received large annual budgets to procure modern platforms and weapons in recent years based on piracy in the region and the anticipated "grab for resources in the Spratlys" that may threaten Thai shipping lanes. In recent years, the Thai government has placed greater emphasis on the RTN, in line with the growing feeling that the country's maritime interests are most threatened; these include 80 off shore oil platforms, as well as the country's vast fishing fleet (the third largest in the world). Disputed maritime borders and SLOC must also be monitored and defended. The purchase of the aircraft carrier has also been partially justified by the navy with reference to a required search and rescue capability for offshore platforms and for general disaster relief operations. A greater role than mere defensive duty is envisaged for the RTN. The government's decision to purchase an amphibious assault ship signaled its willingness to develop a genuine blue-water capability. As maritime disputes have grown in number and magnitude since the end of the cold war, so the need for such a capacity seems to have grown. There are indications that Thailand wants not only to increase its capability in its own territorial waters but also in the Andaman Sea. Although Thailand appreciates the prestige of military hardware, she is way behind Singapore, Indonesia, Malaysia and even Vietnam in submarine capability. Over the years, the RTN has acquired a mix of European, US and Chinese platforms-sometimes with tragic consequences, as they are not interoperable. "The RTN has limited capability to carry out its primary mission of providing seaward defence in the Gulf of Thailand, South China Sea and Andaman Sea. This capability is largely defined by the absence of any serious external maritime threats beyond countering piracy, narcotics, arms and people smuggling and fishery protection." The RTN has big ambitions but there are difficulties to overcome. One is the limited time at sea given to its personnel and equipment. A combination of low budget priorities, lack of spare parts and maintenance funding, and the country's past economic difficulties all detract from readiness. In addition, few personnel are sent for overseas training. Exercises are conducted with several partners including the U.S., Australia, and Malaysia, but Thai participation in these operations tends to be fairly low-key. A small number of Chinese naval personnel are known to be serving on Thai ships as part of the training process linked with the acquisition of Chinese platforms and systems but these are short-term deployments. Paul Pryce noted in 2015 that "In response to an increase in Somali-based piracy, Combined Task Force (CTF) 151 was established in January 2009 to secure freedom of navigation along international shipping routes in the Gulf of Aden and Indian Ocean. Although comprised largely of vessels and crews from NATO member states, Thailand deployed a Pattani-class off-shore patrol vessel and a supply ship to join the force in 2010-2011. This was an unprecedented move. For the first time, Thailand deployed military assets abroad to defend its interests. HTMS Pattani and HTMS Similan, the supply ship, did not simply serve in token roles: Thai forces engaged in combat against pirates in two separate incidents on October 23rd, 2010." In June 2015 the navy picked Chinese submarines costing 12 billion baht each [$1.1 billion total] to be commissioned in the force. The majority of the 17-strong committee voted to buy three Chinese submarines, saying it was the "best value for money". The rest were split between submarines from Germany and South Korea. The navy also received offers from Russia, Sweden and France. In 2011, the navy looked into the purchase of six German-made submarines at a cost of 7.7 billion baht. However, the project was rejected by the then Yingluck Shinawatra government.